Whether you relish a visit from Santa or celebrate by lighting a Hanukkah menorah, you can celebrate both Christmas and Hanukkah on a winter cruise. Cruise lines go all out with seasonal decor (from Thanksgiving through New Year's), holiday games and activities, religious services and special holiday food and drink. Even better, you don't have to cook, clean or make nice to your least favorite relatives. 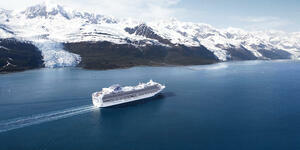 Of course, every cruise line puts its own spin on holiday cheer. Keep reading for a line-by-line roundup of onboard celebrations to find the best Hanukkah and Christmas cruises for you or your family. 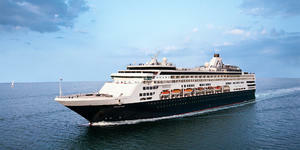 Christmas: Azamara ships will be decorated for the holidays from the beginning of December. Crew will perform carols at various times and in different venues. Christmas cookies will be served the entire voyage. A priest will be onboard to lead religious services. The ships will offer special holiday-themed buffets in Windows Cafe, as well as special menus in the main dining room and specialty restaurants on December 24 and 25. 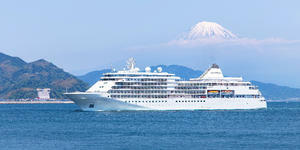 The cruise director will have a special Christmas Show on December 25. Hanukkah: A rabbi is onboard all ships for the Hanukkah celebration. 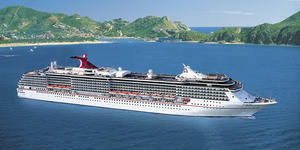 Christmas: On Carnival Christmas cruises, ships will be decorated with holiday wreaths, Christmas trees and lights, and signs proclaiming traditional holiday greetings. Seasonal music will play in passengers' cabins. The cruise director and staff will offer several holiday-themed shows throughout each cruise, and at least one seasonal movie, such as "Polar Express" will be shown. A special holiday performance, featuring children and the decorations they made in the kids club, will be a highlight. Santa will visit with gifts for the kids, and a traditional Christmas dinner -- featuring turkey and pecan pie -- will be served. As part of Carnival's Seuss at Sea program, there will also be special Grinchmas activities in which to take part onboard, including arts and crafts, face painting and an appearance by the Grinch himself. Hanukkah: A menorah-lighting ceremony will be held on each night of Hanukkah. 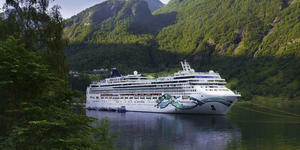 Christmas: During the season, Celebrity ships will feature pop-up atmospheric performances, choir performances, a holiday-themed show and a holiday celebration with a snow machine and a DJ system, as well as "port vs. starboard reindeer games," Christmas movies, and gingerbread houses and cookie decorating. For kids, there will be a Santa parade leading to a winter wonderland, gifts for kids and teens, kid-friendly interactive classes and a Fun Factory holiday carnival. There will be Christmas services on the holiday itself. Hanukkah: Rabbis will be onboard to celebrate the holiday with daily menorah lightings. Christmas: During Costa Deliziosa's Caribbean and Bahamas Christmas sailing, the ship will feature holiday decorations throughout, and there will be photo opportunities with costumed crew members. 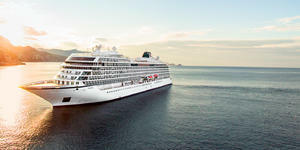 A seven-course Christmas dinner featuring Italian and Caribbean specialties will be served on Christmas Eve, and a mass will be held onboard. Christmas caroling and holiday arts and crafts will be available for children. On Christmas Day, Santa will hand out gifts to all the kids onboard. Hanukkah: No Costa ships will be sailing in North America during Hanukkah. 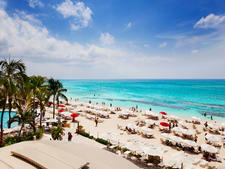 Christmas: Each Crystal Christmas cruise will be kicked off by a tree-lighting ceremony. Decorations will include trees bedecked with shimmering glass ornaments and jewels, gingerbread houses and whimsical reindeer wearing pine harnesses. Hot chocolate, glogg (mulled wine) and an incredible daily assortment of holiday cookies from around the world will be served throughout the cruise. Special seasonal movies will be shown in the ships' theaters and on the in-room televisions. Clergy will be onboard to lead Catholic and Protestant Christmas Eve services. Christmas Eve will include a dinner of roast goose, religious services and an evening holiday show. Christmas Day will bring eggnog, a gala luncheon and a visit from Santa in the morning with gifts for youngsters onboard. A traditional Christmas Day dinner, featuring roast turkey, will also be served. Hanukkah: Hanukkah will be festive with blue, white and silver floral arrangements. There will be a menorah lighting, daily get-togethers with a rabbi and Hanukkah gelt (chocolate coins) for kids of all ages. Special Hanukkah meals will include gefilte fish, kosher chicken, matzo ball soup and latkes (potato pancakes). 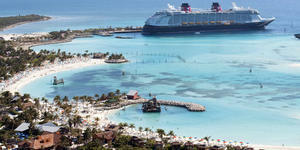 Christmas: Disney's "Very Merrytime Cruises" run from early November through the New Year. During these sailings, passengers can enjoy holiday-themed crafts like making gingerbread houses and decorating stockings, Dickens-inspired carolers and a tropical deck party. Disney characters will host Mickey's Tree-Lighting Magic on the first night of the cruise, when the three-deck Christmas tree will be lit. At Santa's Winter Wonderland Ball, passengers can celebrate the arrival of Santa and Mrs. Claus with Broadway-style entertainment, holiday music, dressed-up characters and a "snowfall" in the atrium, courtesy of the "Frozen" princesses. A midnight mass is planned for Christmas Eve. Church services are also planned for Christmas Day, along with visits from Santa Claus in the atrium and Christmas feasts in all three main restaurants. Disney's private island, Castaway Cay, will become a tropical winter wonderland -- complete with "snow," a Christmas tree, Disney character meet-and-greets and holiday island music. Hanukkah: Candle-lighting services will be held each day. Christmas: On Christmas cruises, holiday cookies and cider are offered in the atrium and Explorer's Lounge upon embarkation. Holland America has also planned a full range of family activities, including holiday decoration-making, trivia and special movie screenings. There will be carolers, a tree-lighting ceremony, eggnog and holiday-themed treats served onboard and special activities in Club HAL. Christmas Eve celebrations will include a special crew concert, a Santa's late-night milk-and-cookies snack and a turn-down gift in passenger staterooms. On Christmas Day, a special brunch is planned, as well as a visit from Santa for the kids, complete with a holiday sing-along and presents for kids. Clergy will be onboard to hold services, including a midnight mass. A gingerbread village will also be on display either in the Explorer's Lounge or on the Lido deck. 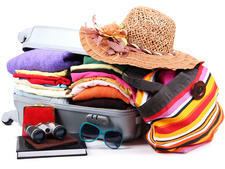 Hanukkah: A passenger get-together is held each night of the holiday, and a rabbi will lead a menorah lighting. Electric menorahs also will be showcased at the front desk and in the Neptune Lounge. Passengers can enjoy traditional dishes, such as latkes. 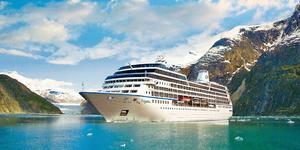 Christmas: On MSC Seaside, MSC Divina and MSC Armonia, passengers can take embarkation photos with Santa and his elves. 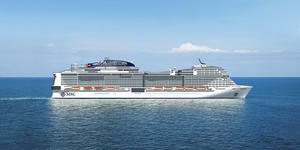 The ships will feature traditional decorations, Christmas trees and lights. 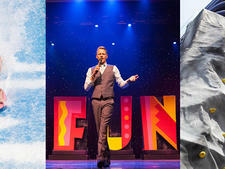 Holiday entertainment includes Christmas carols, Broadway-style Christmas shows throughout the week, holiday music by live musicians, seasonal movies, themed games like trivia and bingo, and holiday music karaoke. Passengers can also participate in themed cooking demonstrations. On Christmas Eve, a gala dinner on the three ships will feature roast turkey, butternut squash soup and a yule log. On Christmas Day, Santa will arrive by zipline, and passengers can dine on a festive lunch with buffet additions like Christmas cookies and a "Happy Holidays" cake. 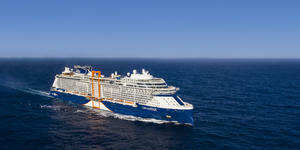 Christmas mass will be held onboard. 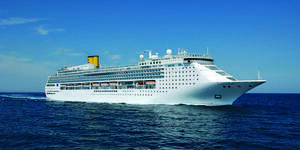 Themed cocktails -- like the Christmas Star (limoncello and prosecco) and Snowflake (dark rum and banana) -- will be on offer throughout the cruise. Hanukkah: For those celebrating Hanukkah, both MSC Divina and MSC Seaside will host a nightly menorah lighting, with a large menorah on display in the main atrium. 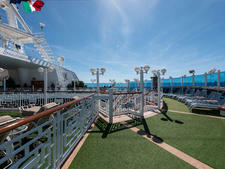 The ship will serve some traditional Hanukkah foods, and special kosher meals can be ordered in advance. Families can enjoy chocolate coins and games of dreidel. Christmas: Norwegian ships are to be decorated throughout with poinsettias, Christmas trees, twinkling lights and other holiday decorations. Culinary teams will create a gingerbread house and holiday village, which will be displayed in each ship's atrium. Special goodies will be available to passengers, including holiday cookies, yule logs, pumpkin pie and more. On Christmas Eve and Christmas Day, crew members are slated to perform in the theater and lead carols throughout the ship. Santa visits on Christmas Day, as well. Dinner service on Christmas Day will include a holiday-themed menu, and the ship offers an extended Champagne menu. Hanukkah: A centrally located menorah will be lit each evening during the holiday. Christmas: Oceania ships will be decorated with festive yet tasteful holiday decor, with gingerbread villages for passengers to admire. The holiday menu will include roast turkey, goose or ham; traditional trimmings; sweets and eggnog. There will be caroling on Christmas Eve, themed entertainment and special guest performers. An interdenominational service will be held on Christmas Eve. Santa will visit Christmas morning with gifts for children onboard. Hanukkah: Hanukkah activities will include a nightly menorah-lighting ceremony. The holiday menu will include potato latkes, matzo ball soup and challah. Christmas: A tree-lighting ceremony will take place early in the season, and passengers can take classes in mini-wreathmaking and gift-wrapping. 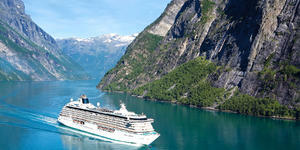 Ships will be trimmed with festive holiday decor, and cabins will feature virtual yule logs. Princess' Christmas revelry will feature a daily snowfall aboard all December sailings (with the exception of Pacific Princess and Ocean Princess). Innovative snowmaking machines will create romantic winter flurries in the atrium, allowing passengers to experience a white Christmas without the need for mittens or a coat. Christmas Eve will include a special show, caroling, parades and music throughout the ship. There's a midnight mass (only if a passenger volunteers to lead the service). Christmas Day brings eggnog, a special Christmas feast and themed children's activities. Santa will deliver a wrapped gift to all kids ages 12 and under. Other Christmas celebrations will feature a "gingerbread challenge," a card-making craft activity, a Christmas carol pop star talent show, holiday films and an onboard reading of "A Visit from St. Nicholas." Hanukkah: Hanukkah will be celebrated on each of the eight nights with the lighting of a menorah, traditional songs and special holiday meals that will feature Jewish foods, such as latkes, matzo ball soup and gefilte fish. Themed activities for kids might include holiday stories, such as a reading of "Sammy Spider's First Hanukkah." Christmas: The ships will be festively decorated for the holiday season -- think magnificent gingerbread house displays -- and passengers can attend holiday-themed entertainment. On Christmas Eve, Regent will feature a dinner menu with Christmas dishes from various European countries, and on Christmas Day, the line will offer a traditional American Christmas dinner. An interdenominational service will also be held on Christmas Eve. Christmas cookies, eggnog and Christmas carols will be part of the festivities. There will even be Christmas cookie-decorating classes for children. Hanukkah: There will be candle-lighting services each night of Hanukkah, as well as a Hanukkah dinner, featuring gefilte fish, matzo ball soup, latkes, roast chicken and cheesecake, concluding the eight-day celebration. 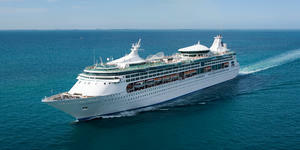 Christmas: On Royal Caribbean's Christmas cruises, ships will be decorated for the holiday season. Christmastime activities include holiday movies shown poolside and at the AquaTheater (come in your PJs), a World Wildlife Fund Walk for Polar Bears, ugly sweater party, gingerbread cookie-decorating class, scavenger hunts and themed trivia. 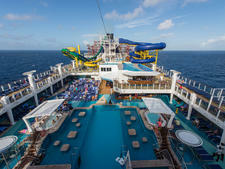 Families can enjoy story time and holiday arts and crafts with Royal Caribbean's "elves." On Christmas Eve, the Windjammer Marketplace will host a milk-and-cookies corner. On Christmas Day, a special event will celebrate Santa's arrival, and passengers can enjoy a Christmas brunch. Hanukkah: A rabbi will be onboard for services. Hanukkah will be celebrated with a daily candle lighting and holiday-inspired food. Christmas: Seabourn ships will be decked out for the holidays with a gingerbread "village" (complete with cookies to keep passengers from eating the display), Christmas trees throughout the public areas and evergreen decorations on the railings. From Christmas Eve through the day after Christmas, an additional display made up of a gingerbread house, themed chocolates and candy, Christmas cookies, and dried and fresh fruits will adorn all the buffet service areas. On Christmas Eve, a basket or plate of holiday goodies will be delivered to each cabin at turn-down. A special Christmas performance will showcase holiday music throughout the ages, and a formal dinner will include a holiday feast, paper crowns and Christmas crackers. 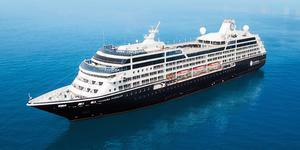 A Catholic priest will be onboard during these cruises. Extras such as yuletide log cake at the brunch buffet and holiday drinks are also included. 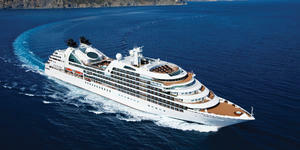 Seabourn singers will sing Christmas carols throughout each ship. Hanukkah: A menorah will be on display, and a rabbi will be onboard to lead nightly services. A menu of Hanukkah dishes -- featuring latkes, matzo ball soup, oven-baked chicken, chopped liver and herring -- will be available nightly. 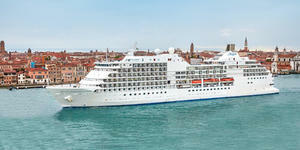 Christmas: Not only will Silversea's ships be decorated for the season, but the cruise line's master chefs will get into the act, as well. Cheery and whimsical gingerbread cottages, chocolate creations and cookies will add to the decor, along with the traditional greenery and ornaments. During the season, eggnog, mulled wine and hot chocolate will be available. Christmas services will be led by onboard clergy. Both passengers and crew can participate in caroling. There will also be a special holiday offering in the show lounge and a visit from Santa Claus for all onboard. Christmas: Viking ships will sport elegant decorations for the festive season. Holiday-themed activities include caroling, special readings and a holiday show. On Christmas, a festive dinner will feature dishes like anise-spiced butternut squash soup, roast turkey, stuffing, pumpkin mash and a holiday yule log cake. Hanukkah: Ships have a menorah onboard that is lit each evening of the holiday. 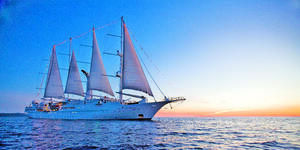 Christmas: Each Windstar ship will be decorated with beautiful holiday decorations, including trees, wreaths, garland and lights. The crew also will put on a holiday talent and caroling show. The ships' executive chefs will go all out with a special holiday menu, featuring seasonal ingredients; dishes include roasted butternut squash, griddle-seared scallops with parsnip puree, butter-poached lobster tails, herb-crusted beef tenderloin, gingerbread souffle and yuletide logs.